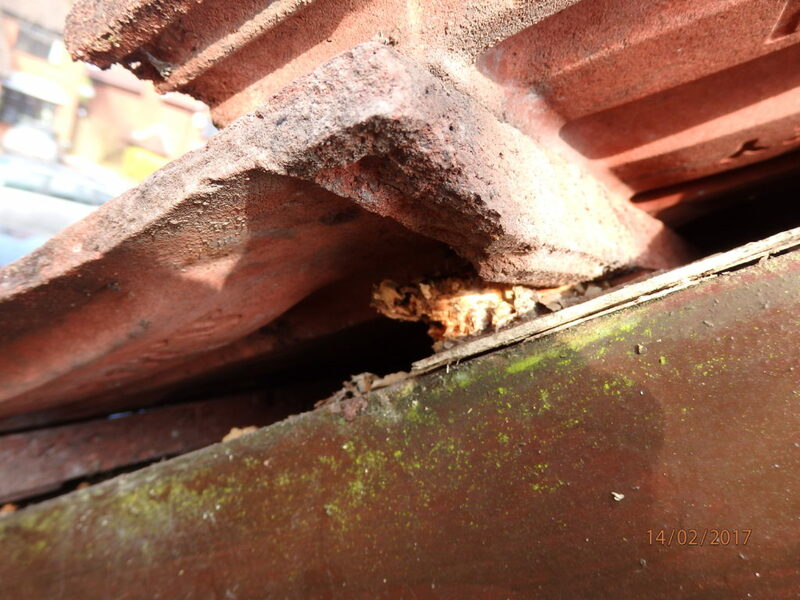 We were recently called to a property in Stoke on Trent after a client was quoted £3.5k for substantial roof repairs relating to roof verge failure. This is quite a chunk of money considering that the roof was on a property built in the mid 90’s; surely we can expect a new roof to last longer than 20 years can’t we? 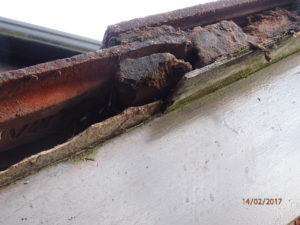 What we found on attending was fairly representative of the issues we find when inspecting fairly modern roofing installations. 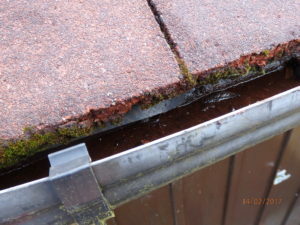 We found substantial failure of the cement verge fillets and resultant moisture damage to both the cement board undercloak and the tannelised roof batten ends. 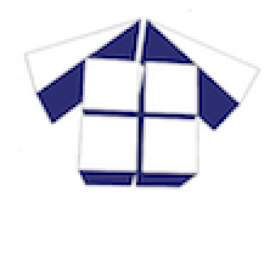 We understand that the roofer had suggested works to replace the sarking membrane but since water ingress by wind driven rain or otherwise, had not been a problem then this was clearly an unnecessary recommendation. Wind driven rain tends to only affect shallow pitch roofing and since this roof pitch was circa 45 degrees then we saw no need to spend money addressing a problem that didn’t exist. 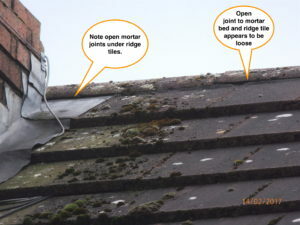 Sarking membrane not draped into gutter and no alternative eaves flashing detail. The mortar does not contain the minimum 30% required sharp sand. The verge tiles have not been bedded on the mortar in one operation. It is a mistake to try and point verges after the tiles are already in place and given the depth of remaining cement verge fillets, we feel that this is precisely what happened. Failed verge fillets are top of the NHBC’s hit list because it is one of their most commonly reported defects on relatively new build properties. They also commonly report a failure to add sharp sand to the roof mortar mix. Thinking the problem through logically, if the cement verges have failed then can we expect similar problems with a failure to ridge tile mortar beds? In almost all cases, the answer is yes… if they failed to add sharp and to the verge mortar then why should we expect to see it under the ridge tiles! A shot with a zoom camera confirmed evidence of failure to the mortar bed joints. 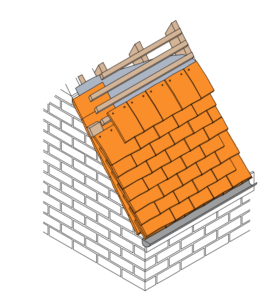 You may not know that the fixing requirement has changed for roof ridge tiles under BS5534 and it is no longer allowable for ridge tiles to be simply bedded on mortar; they must also be mechanically fixed now so the repair specification we produced covered this point. The repair specification included for stripping off the large format interlocking concrete tiles at the verges, renewing the fibre cement undercloak and cutting out and replacing tantalised roof batten ends affected by wet rot. Critically, the mortar mix was correctly specified and it was further detailed that verge tiles should be replaced on a fresh bed of mortar and nailed in one operation. Similarly it was specified that ridge tiles should be re-bedded on the correct mortar mix and mechanically fixed to the ridge. We would substantially extend the life of this critical roof detail if roofers understood the critical importance of adding sharp sand to their mortar mix. Highly unlikely Tom, but Chrysotile was used up until about 2000, You have to assume that any house built before that date may contain some. If it does, it’s very low risk, so long as you don’t drill or sand it.